Columbus Web Analytics Wednesday was last week — sponsored by Omniture, an Adobe company, and the topic wound up being “Facebook Measurement” (deck at the end of this post). 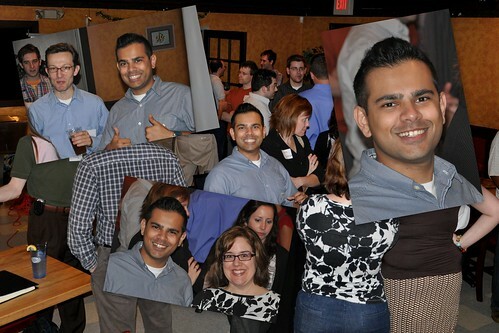 For some reason, Monish Datta cropped up — prominently — in half of the pictures I took while floating around the room. In my never-ending quest to dominate SEO for searches for Monish, this was well-timed, as I’m falling in the rankings on that front. You’d think I’d be able to get some sort of cross-link from http://www.monishdatta.com/, but maybe that’s not to be. Due to an unavoidable last minute schedule change, I wound up pinch-hitting as the speaker and talked about Facebook measurement. It’s been something I’ve spent a good chunk of time exploring and thinking about over the past six months, and it was a topic I was slated to speak on the following night in Toronto at an Omniture user group, so it wound up being a nice dry run in front of a live, but friendly crowd. In June, Columbus Web Analytics Wednesday is actually going to happen in Cincinnati — we’re planning a road trip down and back for the event. We’re hoping for a good showing! Matt Clark? That d00d looks just like me. 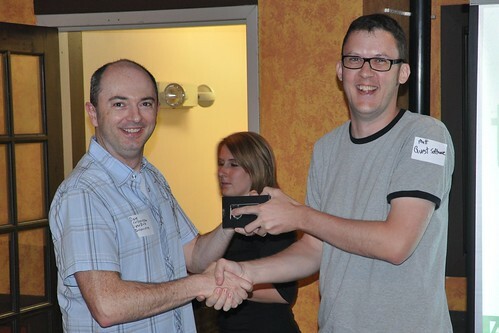 Oddly enough, I was there and won a very similar prize, but my name is Matt King. Doh! Sorry, Matt. That’s fixed!